NORTH ATTLEBORO, Mass. – Through the first 12 minutes, North Attleboro’s offense had ran just four plays compared to Franklin’s 20. But that was fine, considering the Rocketeers were able to grab a pair of touchdowns from the defensive unit. Nick Rajotte had a 35 yard pick six in the first quarter to put North Attleboro up 7-0 and on Franklin’s next possession, Rajotte had a 50 yard fumble return to give the hosts a 14-0 lead. North Attleboro improved to 4-0 on the season with a 28-6 decision over Franklin. Franklin moved the ball 34 yards on its first drive but were finally forced into a punt. North Attleboro’s offense went right to work with sophomore quarterback Chad Peterson, hitting junior Bobby Mylod for 12 yards followed by a 24 yard connection with Kyle Gaumond. A pair of runs from Nick Morrison moved the chains but the ball came free on the second carry and Franklin’s Tyler Gomes pounced to get the ball back for the Panthers at their own 27. On the fifth play, the Panthers tried to run a screen pass but Rajotte stepped in and intercepted the pass and raced untouched to the end zone for a touchdown. An extra point from Connor Flynn made it 7-0 with 2:46 left in the first quarter. The Panthers again got some movement on offense, keyed by a 19 yard run from Jake Wolowacki (20 carries, 53 yards). Wolowacki was nearly off to the end zone but a shoe string tackle from Flynn brought him down at midfield. 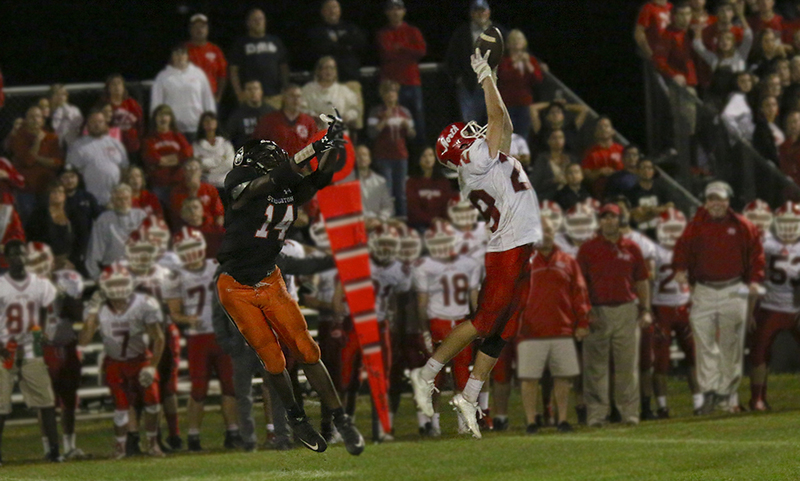 The tacked proved to be key as three plays later, Rajotte came on a blitz and had a clean shot at Franklin quarterback Brad Jarosz. Instead of a take down, Rajotte swatted the ball clean and took possession all in one motion and brought all the way for a touchdown. Both teams traded punts before the Rocketeers defense came up with another key stop, this time forcing a turnover on downs. Franklin was able to get it to 2nd and less than a yard on their own 41 yard line but the Rocketeers stuffed two rushes for no gain and then a QB sneak on fourth down to get the ball back with just 50 seconds left in the half. North didn’t take too long to cash in as two plays later, Peterson linked up with Mylod right down the middle and Mylod broke through a pair of tackles to find the end zone for a 37 yard touchdown with 31 seconds left in the half. Neither team was able to find the end zone in the third quarter. The two sides traded punts and then a fumble from North inside the Franklin red zone gave the Panthers possession back. A penalty put a wrench into Franklin’s plans on the next series and North took back over. However, Franklin’s defense came up big as Khyler Colella knocked a pass down on fourth down to get the ball back. On North Attleboro’s next series, Kyle McCarthy took over at quarterback and gained 24 yards on the first two plays on the ground. An 11 yard gain from Morrison set North up for 1st down at the Franklin 27. McCarthy then fired a pass right down the middle that Flynn was able to dive out and haul in with just one hand in the end zone for a touchdown. Connor MacIver’s extra point made it 28-0 with six minutes to go. 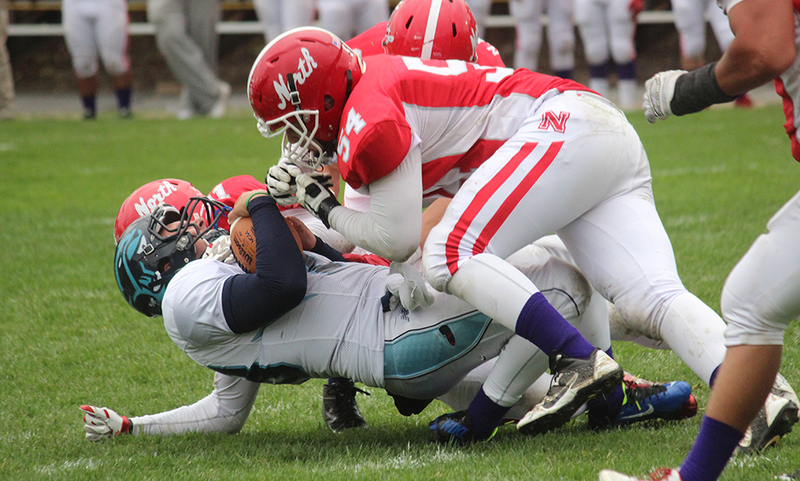 North Attleboro finished with 230 yards on the ground, led by Mylod’s 63 yards on six carries. Eight others got carries for the Rocketeers including Rajotte (six carries, 51 yards), Morrison (four carries, 34 yards), McCarthy (four carries, 30 yards) and Nolan Buckley (three carries, 26 yards). Franklin was able to strike on its next series on the third play. Jarosz floated a perfect pass down the right sideline to hit Sam Harrell in stride for a 47 yard score. The two point attempt failed to bring the score to 28-6 with 4:39 left. “We knew we’d have to try and run the ball on them to try and negate their speed but of course the two defensive touchdowns are killers,” Franklin head coach Brad Sidwell said. “We did some good things. They’re stout on defense like we thought they’d be. North Attleboro (4-0, 2-0) will look to keep its perfect start going when it travels to Attleboro (2-2, 1-1) this coming Friday. Franklin will look to bounce back when they host King Philip (1-3, 1-1) on the same night. 1st Quarter: (NA) Nick Rajotte 35 yard interception return, Connor Flynn XP good. 2nd Quarter: (NA) N. Rajotte 50 yard fumble return, C. Flynn XP good; (NA) Chad Peterson 37 yard pass to Bobby Mylod, C. Flynn XP good. 4th Quarter: (NA) Kyle McCarthy 27 yard pass to C. Flynn, Connor MacIver XP good; (F) Brad Jarosz 47 yard pass to Sam Harrell, 2pt failed.